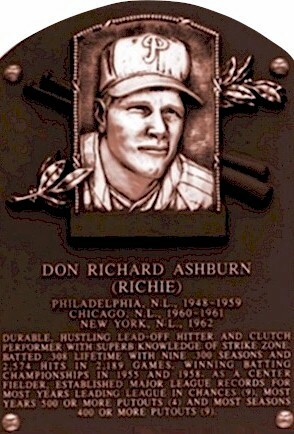 Richie Ashburn was a durable, hustling leadoff hitter and clutch performer with superb knowledge of the strike zone. 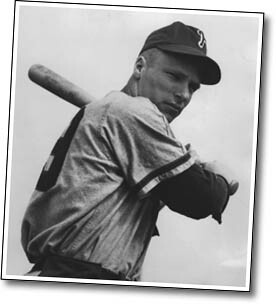 A fan favorite, "Whitey" batted .308 with nine .300-plus seasons and 2,574 hits in 15 years, winning batting championships in 1955 and 1958. 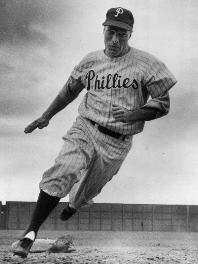 A core player for the 1950 Whiz Kids, the center fielder established major league records for most times leading the league in chances (nine), most years with 500 or more putouts (four) and most seasons with 400 or more putouts (nine). Ashburn spent 35 years broadcasting Phillies games after his playing days, many of them with legendary broadcaster Harry Kalas.